Have you ever looked at the color of kitchen cabinets? They can run the gamut of colors from black and red to blue and green. By far, the color you see most is white and have you ever wondered why so many people choose white kitchen cabinets? Unlike many of the other colors out there, white kitchen cabinets have many benefits that they don’t. Kitchen cabinets cost a lot of money. They’re an investment and you’re going to have them for many years. You want to make sure they match the décor of the kitchen and possibly any changes you make in the future. We all get bored of the same décor after a few years. You may love that country theme at first, but seven years later, your entire kitchen is decked out in Coke memorabilia. One of the greatest advantages of white cabinets is that they go with so many decors. It can be frustrating to come up with the perfect décor only to have it clash with the cabinets, but with white, you don’t have to worry about it. Since the color is so popular among kitchen cabinets, manufacturers churn out many different styles and configurations in this color. When you go to the showroom, the seller wants you to be able to visualize your kitchen, and that’s a little easier if the colors match. One of the most impactful decisions, as far as money is concerned, when buying kitchen cabinets is choosing between in-stock, semi-custom and custom. Since many come in white from the start, you have more of a variety of non-custom cabinets to choose from. Don’t let the color of your cabinets cost you more money if it doesn’t have to. One of the biggest disadvantages comes from one of white cabinets’ advantages. With the color being so popular, many people might consider it bland and uninteresting. There is little doubt that black kitchen cabinets, or some other striking color, are very attractive. If you want to have something eye catching in the kitchen, then don’t pick white. White cabinets also show dirt, stains and other signs of wear and tear easily. If you spill spaghetti sauce on your white cabinets and let it stain, guests will have no problem seeing it against the bright white. You’ll need to clean the cabinets regularly for dust and other things that can dull the color and make your bright white cabinets look dingy. If you end up with white for your cabinets, then a wash cloth and warm soapy water will become your best friend. Whether you’re looking into white or some other color for your cabinets, you’ll need to see what it looks like ahead of time. You can compare and contrast with our design tool. 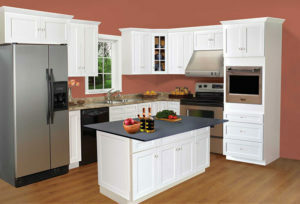 Check it out here and let it be the beginning of your ready to assemble kitchen cabinet adventure.